Last winter, Clint picked up the hobby of snowboarding. Oh, my heart couldn't take it. I told him, "Are you sure? You're getting old. You're not as agile and athletic as you used to be." But working out in the snow will make a person decide to give these things a try. 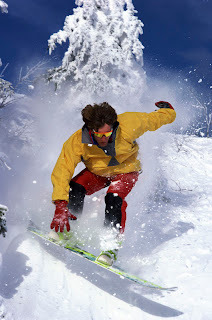 He had some great guys who were fairly adept at snowboarding take him under their wing and teach him their ways. It was very exciting for him. One night he texted me and said, "I'm coming home. I got hurt. I may need to go to the ER." Then he texted me and said, "When I get there, don't freak out. It won't help." Too late. But I did my best to hold it in. He came through the door and lifted his pant leg to show me his "scrape." It was more like a big hole that had been gouged out of his calf. I wanted to freak out. Inside I was screaming. But instead I said, "Oh, that's not so bad." Thankfully no stitches. But the scar is still visible. A great reminder indeed of how careful we need to be. That was last season. His first season. This year, his second year, he's feeling more confident. One of the regulars out at the park was talking to him the other night and suggested that he buy a bunch of different types of padding. He even gave him some shorts that really weren't just shorts. They were made especially for snowboarders with padding in all the right places. My first reaction was, "I don't know about this. Won't putting padding all over just make you think you're more safe and cause you to be less cautious out there? Won't it increase your chances of trying something crazy and possibly getting hurt?" But the more I mulled that thought over the more I thought, isn't that what I want? Don't I want him to feel safe? Don't I want him to land on padding if he should happen to fall? He needs to be protected out there. And when he's protected guess what? I'm protected. I feel like I might be stretching this analogy here a bit, but go with me… Snowboarding and marriage. They go together, right? Your spouse needs to feel safe in your marriage. Especially for women, security is a major issue. We need to feel like our marriage, our relationship with our spouse, our home, is a safe harbor. That it's a place where we can be open, be ourselves, take risks, resolve conflicts, try new things, grow as a person and a couple. That doesn't happen when one or both parties don't feel safe. When we take the time to create safety, put padding up in all the right places, it creates an atmosphere that allows us to be all we need to be and do all we need to do to make our marriage work. Safety makes us feel like we can try something new and still fall flat on our face without getting hurt. Safety allows us to be a little more daring, put our heart on the line a little bit more, because we know that we are protected. Safety gives us courage to take risks for the sake of the our marriage. What do you need to do, what padding do you need to put in place, to make sure that your spouse feels safe? To make sure that your marriage is a safe place for both of you? Copyright © 2012 Alecia Starks. Reprinted with permission. Alecia and Clint Starks are counselors who blog at Marriage Life, where they share their experiences as part of helping others do the necessary hard work on their own marriages. Alecia, what a beautiful post. I like how you used your personal experience to segue in to the safety of marriage. While men tend to be the "tougher" gender, I think they need to feel just as safe. Little remarks, criticisms, they all add up. Both partners need to feel safe in a marriage, and your post does such a nice job of showing how you did just that. I like how you didn't let your fear interfere with your husband's desire to try something new. What an inspiration. Thank you! Thanks Tammy! Appreciate your comment! It's hard to let him go off and do that because the thought of going down a hill scares me to pieces :) but its important to give each other the space and freedom to try new things and enjoy different things. Safety allowed my wife to go back and get her masters, me to return to guitar lessons after 15 years and give a concert, and us to goofy-dance and sing Dave Matthews and Red Hot Chili Peppers tunes with gusto and soi-disant panache all night long. Sounds like a lovely household :) and like you two have got this "giving each other space to try new things" thing figured out!